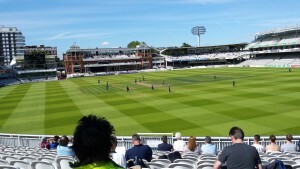 Monday was spent in glorious sunshine at Lord’s cricket ground in St John’s Wood. The ‘all’s right with the world’ invocation of the sound of leather on willow, the greensward and the cricket whites, is over-used in my opinion, but then…. 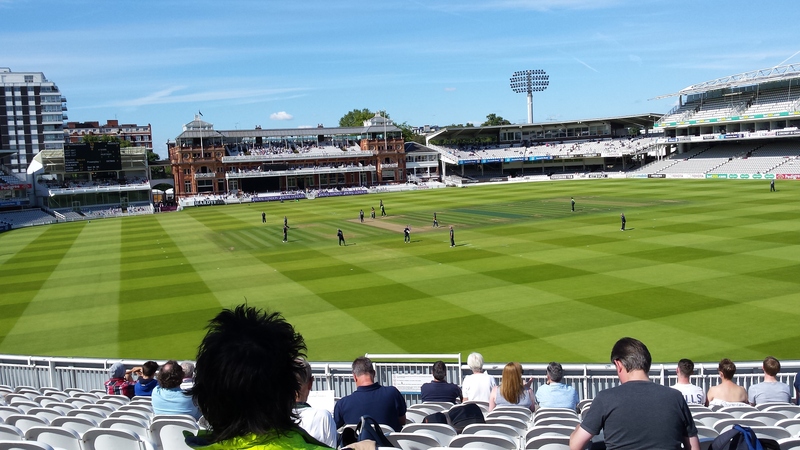 Sitting under a perfect blue sky, looking at a checkerboard of green and listening to the low sussuration of anticipatory talk around the ground, as the MCC flag fluttered in the breeze above the Grand Stand, was a fine experience. 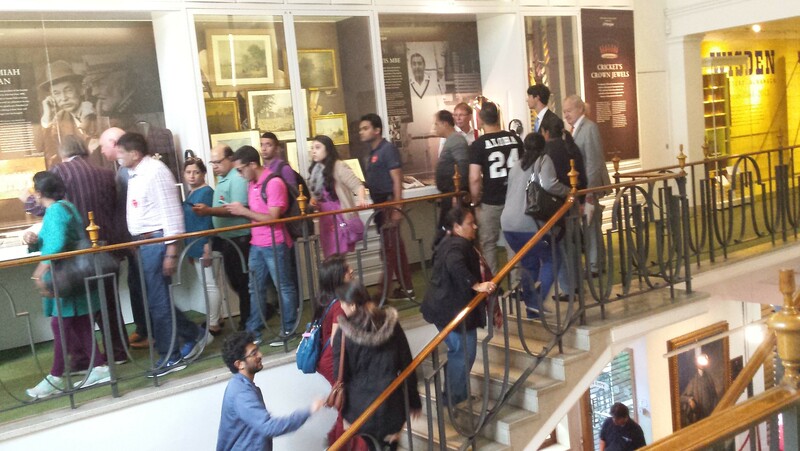 Lord’s itself is full of history and I visited the MCC and Lord’s Museum during the lunch interval. I was fortunate to coincide with the start of a Lord’s Tour and listened to the informative and entertaining guide. The first Lord’s cricket ground was east of the current site, where Dorset Square now stands. It was set up in the 1780s by an enterprising Yorkshire man, Thomas Lord, then employed by the White Conduit Club in Islington, one of the leading London clubs of the day. He was, fortuitously, also a wine merchant. The first match there was in 1787 between teams representing Middlesex and Essex. Thomas Lord opened a wine shop, through which people had to pass to get into the ground and soon Lord was purveyor of wine to high society ( and making far more money than from the cricket ). The White Conduit members used it regularly and began calling themselves the Marylebone Cricket Club, because of the location of the ground. When the lease ran out in 1811, Thomas Lord refused to pay the increased rent and closed the ground, moving it ( including the turf ) a few hundred yards westwards to the rural St John’s Wood. This ground did not prove popular with cricketers, but Lord turned it to his advantage when the proposed route of the new Regents Canal ran south of Regents Park and he received hefty compensation and an alternative lease, on the current site. 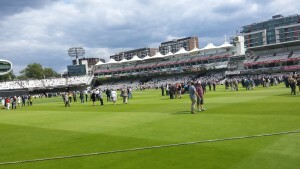 The first match at the new Lord’s took place in June 1814, when the MCC beat Hertfordshire by an innings and 27 runs. Thomas Lord did not endear himself to members, however, in 1825, when he announced his intention to build houses on the site ( the property developer has ever been the scourge of London ). Only a hastily written cheque for £5,000, by a member, one William Ward, a director of the Bank of England and MP for the City of London, rescued the plot. The MCC didn’t gain ownership of its ground until 1864 and, until the early twentieth century, Lord’s was not even the premier cricket ground in London – that being The Oval in Kennington, a much flatter pitch preferred by players. The memory of Thomas Lord’s wine shop lives on today in the Lord’s Tavern, now the Tavern Stand – the old hostelry with iron balconies was demolished in 1967. Another iron symbol of the ground is the 2m tall Father Time weather vane, a gift from the architect of the second Grand Stand, Sir Herbert Baker, in 1926. It now sits atop the lift-shaft between the Mound and Tavern Stands ( out-lasting the stand designed by Baker ). 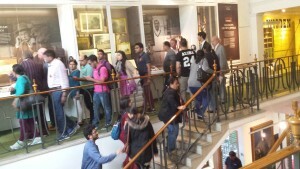 For the museum of an institution which fought so long and hard to maintain the ways of Empire, the MCC and Lord’s is very frank and open about its past. There are sections entitled ‘Politics’, ‘Race’ and ‘Gender’. The first deals with the infamous ‘bodyline’ series and displays memorabilia and artefacts belonging to those who took part in it, as well as referencing other ‘diplomatic incidents’ including the ‘rebel’ tours during the era of apartheid. The second details not just the well-known D’Olivera selection debacle, but an older scandal, involving Ranjitsinghi and it documents the less than respectful treatment of early touring West Indian sides. The third celebrates modern women’s cricket, but also looks back to its long history, of which I was entirely ignorant. Did you know that W.G.Grace first played cricket, because his mother, rather than his father, was a cricketer? That women’s cricket goes back to Napoleonic times? No, I didn’t either. Huge wagers would, apparently, be laid on the outcome of games – so no change there. The highlight of the Museum, appropriately enough in an Ashes Summer, is the coveted urn, which sits in a section all of its own ( and full of folk, like me, taking photographs ). 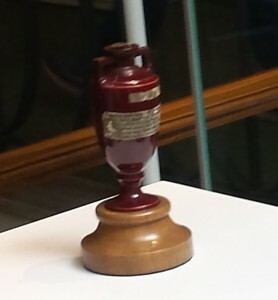 The famous 4 inch symbol of sporting rivalry was presented to the England captain upon England’s victory in Australia, during the touring series of 1882-83 which followed the defeat of England by Australia in 1882 at the Oval. It was that defeat which gave rise to the mock obituary appearing in the Sporting Times, lamenting the death of English cricket and announcing that ‘the body will be cremated and the ashes taken to Australia’. Entry to a London Cup one day game costs £20, entry to the Museum another £3 and tours can be had for £18 for adults, though there are discounts for students, families or people with specific match day tickets. Find out more here. The nearest tube station is St John’s Wood on the Jubilee line. For those interested, on Monday Middlesex beat Glamorgan by an innings. This entry was posted in History, London and tagged Worth a visit by juliej. Bookmark the permalink.